"In At War with Diversity: U.S. Language Policy in an Age of Anxiety, James Crawford tackles a complex question regarding the numerous challenges associated with U.S. language policy: 'How should Americans respond to language diversity?' The six essays in this book provide a provocative perspective on this question, enabling readers to develop a rich, historically grounded, and nuanced understanding of language diversity and language policy in the United States. 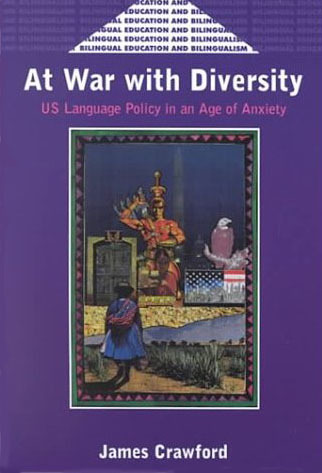 ... At War with Diversity is a valuable book for any language-minority education professional who yearns for a better understanding of the political nature and the ongoing debates surrounding language policy in the United States." "At War with Diversity ... provides a thoughtful analysis of English-only political activism, tracing the history and ideological assumptions of the antibilingual movement from its earliest incarnations in colonial America to the present. He also offers a powerful critique of recent political efforts to challenge the English-only movement, using the case of Proposition 227 in California as a model for failure in this regard. Also addressed in At War with Diversity are contemporary efforts to revitalize Native American languages. His arguments are extremely compelling and make clear the political and ideological nature of educational debates about language, language rights, language policy, and language diversity. Although not explicitly writing for teachers, Crawford's analysis is, in my view, essential background knowledge for any future educator and certainly provides a solid foundation for the development of critical language awareness in the U.S. context." "At War with Diversity is a valuable addition to Multilingual Matters’ Bilingual Education and Bilingualism series, and, like many of the books in the series, would be an affordable and appropriate choice as a course text at graduate or upper undergraduate level in any program in which language policies in education are discussed. Crawford’s readable journalistic style, which draws in and engages the reader without any sacrifice of scholarly rigour, is a fringe benefit not to be underestimated." "This collection's greatest strength is its concise exposition of the historical background of U.S. language legislation and how policies are informed by prevailing sociopolitical contexts. The book's title signals its orientation to the subject, treatment of which is generally even-handed. One only occasionally misses a more neutral tone. Crawford's very readable prose would make this an excellent source of articles for an undergraduate course in sociolinguistics, or to supplement a graduate seminar's reading list. There is some overlap in content between the essays, to be expected since they were written as independent pieces, but this adds to rather than detracts from the work's overall cohesion. The reference section, which includes current newspaper and online sources, and the well-organized index, add to the book's utility." "Taken together, these essays effectively document and analyze the most prominent public policy debates of the past 20 years ... In sum, this compact volume provides invaluable background and perspective on the major issues of U.S. language policy at the beginning of the new century."